Bali Asli’s cooking class is so much more! We learned about the symbolism of the offerings while we constructed our filled palm basket. We learned all about the spices and techniques of Balinese cooking. Penny shared her enthusiasm regarding traditional Balinese cuisine and we loved hearing her perspectives on becoming a chef, living in Bali and being an entrepreneur. And then the food, location and Bali Asli staff were all amazing! Highly recommend the cooking class (time was from about 10 to 2 including enjoying the meal you have created with Penny) and if you haven’t been able to do the entire cooking class, at least go out of your way to enjoy a leisurely and first class lunch at Bali Asli, you will not be disappointed. In terms of the Bali Asli Experience Carrier arranged, Sarah said that she thought Brett was amazing, that he really knows Bali and was a fountain of knowledge. She said he could not have been more capable. She also thought Penny was fantastic and that overall it was one of the best food experiences she has ever had! Penny was an encyclopaedia of Balinese food and a joy to be around. 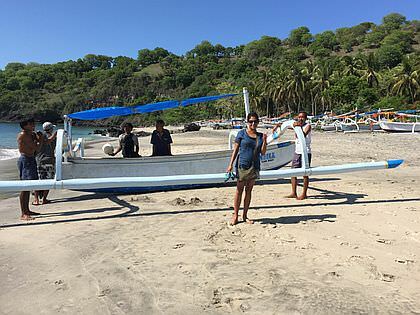 Sarah also said that the location of Bali Asli was incredible and it takes you to the east of Bali which is a much less developed area which she really enjoyed. She said that if she knows of anyone going to Bali she will certainly recommend this experience to them and of course it will feature in her resulting coverage. Penelope, we came (by pedal bike to the restaurant today from Villa Flow) to have lunch and I just wanted to let you know that it was the best food we have had so far this holiday. And what a views. Terima kasih! Bali Asli arranged transport from our villa in Tulamben (roughly 45 minutes). The driver was on time, courteous and safe, and the price was reasonable. We were greeted at the restaurant with a glass of water and a cool towel – an excellent way to start the session. The first half of the day included a walking tour of the local area where our tour guide/head chef/owner Penny provided information on the local community, the fruit, veggies and plants that grow in the area, and the different farming/irrigation techniques. Penny was very knowledgable, while also very easy going. She was very patient with all of our questions. It was refreshing to see and hear about how Bali Asli supports the local community. The second half of the day was the cooking class. We were a group of 5 including two kids. My daughter (8) was appointed sous-chef and had just as good a time as all of us assisting with the cooking. My son (11) also enjoyed the class and declared the peanut sauce “legendary” – a very high rating indeed. It was very interesting to hear about the traditional Balinese cooking techniques and how they differ from those we’re used to in the west. After all our hard work, we enjoyed a wonderful meal which included fried rice, chicken satay, salad, fish, and a pumpkin desert. Despite my lack-lustre descriptions, the food was very tasty, and with only 4 of us cooking and 5 of us eating, we still had left overs. The left overs were wrapped up in banana leaves, and provided in a recycled paper bag for take-away (no plastic! yay!). Overall, we really enjoyed our day and felt that we received good value for the price. We will certainly recommend this experience to others! We had a cooking class at Bali Asli during our Bali tour. The local chef patiently and professionally introduced us to the Balinese cuisine. We were shown how to use fresh ingredients and how to prepare a spice mixture, chicken satai, peanut sauce, nasi goreng, banana leaf fish, farnes salad and a pumpkin dessert. The self-cooked food we were allowed to take in a spectacular setting. For all those interested in cooking, I can absolutely recommend this experience! We were in private round two and it was just sensational! Thanks for this great experience! I did the walking tour of the village led by Penny, followed by a cooking class and lunch at Bali Asli. It was a wonderful experience that gave me greater insight into the local area, the people and the food of this beautiful part of Bali. I highly recommend it and would do it again. A memorable experience from the time of pick up with a visit via the Amlapura Markets to arriving at Bali Asli Restaurant. What made the day extra special was Penny our Chef and the friendly staff. It’s a “hands on experience”, reaping the rewards of eating what we had prepared. The pace is relaxed, the location idyllic – Go try! Bali Asli amazing authentic Balinese style food and service, a must do if you want to experience real Bali style cuisine. Been twice now and recommend to all. Thanks to Penny and staff. The family had a great day. A big heartfelt thank you to Penny and all the beautiful staff at Bali Asli who welcomed us with open arms and shared their knowledge, authentic culinary skills and humour with us at “A Day in the Life of a Balinese Lady” cooking class. The morning wandering the Amlapura markets with Penny was an incredible cultural experience. Then back at Bali Asli Restaurant to prepare our meal (set in breathtaking surrounds) we were immersed in the flavours, tastes and colours of this wonderful part of the world. If you haven’t already – change your plans! Just include a Bali Asli experience (or two) in your travels, it’s an absolute must-do experience. You will love it! About 10 minutes from Tirta Gangga, this place offers incredible food with a fantastic view. We had the Nasi Campur set, which is pricey at Rp155,000 ++, however it was delicious. We also got a free welcome drink and crackers with sambal which was very tasty. Fine dining with classic Indonesian dishes. It was a cloudy day which was a shame as we couldn’t see Mount Agung but the view over the rice fields was beautiful. Service was good – welcoming and very professional. I just want to come back on our experience at Bali Asli on the 7th. Chef Dewa took great care of us and explained a lot during our short trek. Really nice chatting. A nice touch was start the cooking class with an introduction to several ingedients. Cooking itself was just gerat. Good choice of dishes (new ones and familiar ones) and we could cook by ourselves! In a lot of cooking classes your are only watching. Here you are doing the actual work. Loved it! Dewa apadted to our needs and wishes and we spend some hours of fun with him. You can be proud to have such a ambitious employe. Congrats on that. Our hotel in Karangasem recommended this place for lunch so we included it in a day tour. Great views of the valley and Mt Agung (the volcano). Interesting Balinese food with a variety of spices. You must pay a visit to the toilets as they have the best views. Our driver was totally honest and when we offered him money for his lunch and drink, he told us that the restaurant supplies this to him for taking us there. This is common in Bali so just be aware. We booked a private cooking class as a couple. We were picked up at 6.30 am at our hotel in Ubud and had a wonderful 2hour drive through fields of flowers and long the coast. Once we arrived the restaurant, we were greeted a one of the signature drinks (snakefruit and spices, you must give it a try!) which set the tone for a wonderful, unique experience. The view from the restaurant is breathtaking, by the way! We went to the market with Penny who was very patient to explain lots of useful knowledge about the ingredients. She is also very passionate about reducing plastic waste which I appreciate a lot!. Once back at the restaurant, we learned how to make the little flower baskets you see as offerings at temples and were introduced to Balinese ways of praying. This was a wonderful way to mindfully start our cooking journey. We ate the treats we collected earlier at the market and then were taught a variety of dishes using traditional tools such as volcano stone and complex combinations of local ingredients. We really appreciated that the basic ingredients of the dishes were already prepared so that we could focus fully on the instructions and carrying them out. Penny is incredibly passionate and committed with her lesson so that it was one-of-a-kind-experience. Once all the work was done, we got to enjoy our lunch with the best view ever. Do not miss out on Penny’s first class cooking and if you have the time, book the cooking class. We will come back!!! Not a single complaint about a 3 hour bus drive both to and from Bali Asli. We did do Tirta Watergardens on the way home. Everybody loved the views from your deck, the staff and more importantly the wonderful food and home made drinks they all enjoyed. A first time of that sort of experience for quite a few. Thank you for your hospitality, for engaging with us all to share the Bali Asli history as well as the history behind the menu we all enjoyed. Again congrats that the investors have all been paid off and that wonderful place is all yours. Hope your little baby across the rice fields goes back to sleep and business comes back in leaps and bounds. Attached are some pics from our day. Feel free to use on your web page along with anything written in this email. PS. 27 adults and one child from Oz x 15, NZ x 5, Finland x 3, Poland x 1, Malaysia x 1, Czech Republic x 1, Mexico x 1 and the little fella born in the USA. Just letting you know that we had a fantastic day yesterday and our lunch at Bali Asli, topped all lunches we have had together so far! I will write a review on Trip Advisor on the weekend. &bigstar;&bigstar;&bigstar;&bigstar;&bigstar;Excellent food, people and views. Wow what a view. .simply takes your breath away. Food was fresh and simply delicious. Authentic baliense cooking done with flair. If you are in Amed , I highly recommend this restaurant. It is a little off the beaten track, well worth a visit. Penny it was perfect. Beautiful lunch 🥗 🥙 as always and the clouds attempted to clear themselves almost revealing the whole volcano for a little while. That is such a fantastic view over the valley! We will definitely be coming over again so We will catch up with you then. I think Lorrie wants to do some shooting in East Bali so we might come over for a day or two or 3. We have an eye on staying in Sidemen. Beautiful looking place. Or perhaps even a night at Villa Campuhan. I think they are pretty quiet there at the moment. It seems such a shame that everything is so quiet because of the 🌋!!! ***** Great ambiance and fantastic view. Love the bamboo menu as well. Go for the big set menu! We did a 6 hour cooking class with Penni of Bali Asli in Nov 2017. After a very interesting shopping trip to a local market where Penni showed us heaps on all kinds of different fruits, vegetables, and Balinese foodie culture, we prepared our own Hindu offerings and learned how to pray in Bali Asli’s wonderful garden. On the marvellous terrace, Penni gave an intro into different tastes by using interesting examples like Balinese lime, tamarind, galangal, and kencur. Then, we prepared several pastes as bases for developing different tastes in the dishes we were about to cook. Working in parallel – thus intensifying the learning – we prepared chicken sate with self-made peanut sauce, seasoned marlin in banana leaves, nasi goreng, sweet pumpkin sachets, and fern-tip salad. After cooking, we had this wonderful menu on the terrace giving to beautiful rice fields, with the gorgeous mount Agung in the distance. Penni’s self-brewed ciders and the stunning cocktails are highly recommended! P.S. : Mount Agung is not dangerous; the Indonesian authorities are very cautious and would restrict the area if necessary. Also, Bali Asli is ~10 km from mount Agung and situated on a hill. I’ve been meaning to write you and drop a few lines of feedback. The cooking class with your Chef was fantastic. Such an exciting and memorable part of our trip to Eastern Bali. Your restaurant is beautiful, and we had the best time trekking throughout the hills with Dewa– he has a true passion for it, and is very much both guide and guru! I just wanted to say thank you, and let you know that we really enjoyed the day! We had a short stay in Bali at the beginning of January, but our cooking class at Bali Asli was by far one of the biggest highlights of the trip. My husband and I were traveling with our 4 year old, and the sous chef, Mr. Dewar, was very understanding and patient about our experience being adjusted to her pace. We enjoyed a shortened walk in the surrounding rice paddies before digging in and beginning to cook. We learned so much and absolutely loved the experience. Moreover the food was outstanding, and the view was gorgeous. Don’t skip Bali Asli! Well this food experience is hard to beat, Mt Agung in the near back ground reaching out to you will take your breath away. While you take some of the best scenic photos from your table or the huge balcony, the chefs will be preparing the tastiest authentic Balinese food you. The health drinks and home brewed fruit beers are a must. The scenic drive is also wonderful, allow 2.5 hours from Ubud and book in advance. Dear staff, thank you for you hospitality and care in welcoming us. Just back from the amazing weekend at Bali Asli boot camp in East Bali. We ran, we swam, we jumped, we trekked, we cycled, we sweated, we hurt, we ate, we drank, we laughed and we survived! Big shout out to the wonderful Penny Williams from Bali Asli for her expertise and enthusiasm in planning our whole weekend. It was an experience that extended my belief in myself and I did things I have never done before with a group of outstanding people. We loved the cooking class. Everyone was very friendly and Dewa was amazing. My mum doesn’t speak english so I had to translate everything and he was so kind to speak slowly so I had enough time to pass all the knowledge to her. We loved the food, the ambiance and your Bali Asli family. We have learnt heaps. Thank you so much again! Penny let me thank you for an outstanding service and make my Julia taste Bali although her strict diet restrictions. We visited you with Gosia I will take all the tastes of Bali Asli back to Poland. I sit here back in NZ, contemplating the perfectly splendid day we had on Monday 6th June. I cannot find enough superlatives. From the start, being picked up by Made, to meeting you at the market, to arriving at your wonderful home and school, to experiencing your special talent at interacting with us all and your staff, to learning the respect to have for the food, the super loos and the sharing of the food was just the best. Ava has shared her experience with her Dad with enthusiasm. She excitedly showed the photos, described the market and beautiful gardens and the friendly staff and how Penny, “the cooking lady is really really nice”. Loved every minute. Thank you. So happy. All went well. In the end Volker said I should be awarded an Oscar. Volker speaks and understands bahasa very well so we had several close calls. Gudih was really on the ball with diverting certain questions. Hahahah. He thought we were going to visit a cave. Not until we stopped in front of the Jukung did he realize we were going on the water. We caught together 7 fish. I caught 3. Only one was big enough to be eaten. It was so much fun, the sea was flat and peaceful. Dewa was wonderful. His explanations were clear and interesting. He was relaxed and he speaks English well. He took his time and answered all our silly questions. We were hopeless in folding the banana leaves and with a big smile and some teasing words he showed us again several times. I have added some pictures you might like. I had the best experience with the staff at Bali Asli. I started with fishing in the morning and then travelling to the restaurant where the view was to die for. The two guys who takes you are out are so helpful and make the experience worth while. I was travelling on my own and at first was unsure but Penelope the owner and staff make you feel very welcome. Then my passion, the cooking. I have never cooking food like this and I loved every minute and their welcome drink was the best I ever had lol. If you are going to be on the east coast make time to go there for lunch or just do the cooking class. We chose to do the market tour plus cooking class and lunch. A great day. Picked up promptly at 8am from our hotel in Candidasa, we were taken to Amlapura markets where, over turmeric tea, we met our fellow travellers. We were guided through the markets in a leisurely but organised way, and then back into our transport and on to Bali Asli restaurant. A beautiful building, beautifully sited. The tour and class weren’t run by Penny on this occasion, but by the Balinese chef, who took us fluently and informatively through some key groups of ingredients – spices, rhizomes, vegetables. Then into our aprons and onto our knives. We prepared a number of dishes from scratch and either cooked them ourselves at the table, or watched the staff of the restaurant cook them for us, in the case of the sate lilit in a firepit on the restaurant’s terrace with its sensational view, a couple of exotic cocktails and we relaxed over lunch to enjoy the food we’d prepared and the company of the other “scholars”. A thoroughly enjoyable experience, highly recommended. I have been to Bali over 10 times and never experienced anything like this. You can go to many places and have a nice view, and the view from Bali Asli is certainly spectacular but the food is “next level amazing.” The location is a bit of a drive if your not staying in East Bali but totally worth it. I will be making the trip back to this amazing dining experience every time I travel to Bali from now on. Our day started very well with Made. He was on time and very polite. Then, we met your mentor, Dowa who showed us the market and then he explained all the vegetables and fruits we did not know about. He chose two knives that we bought as a souvenir for our sons. We had a lot of fun cooking together and although you weren’t there, I can assure you that it was a superb experience we will never forget. Many thanks to all the staff members that made us feel like family. the life of a Balinese fisherman’ and cooking class. “Thanks for a great time we really enjoyed it”. I came to Bali Asli last week with Sue Mace and a couple of her friends, and I just wanted to write to thank you for guiding us through such a beautiful, memorable day. It’s very inspiring to meet someone who is so passionate about her work, who has built an organization with integrity and love. It was so interesting to learn about the local flora on our hike. I really enjoyed the cooking class and of course the delicious food. I’m much more aware of the flavors in my food now, and am looking forward to the new year when I’ll be able to resume cooking again and playing with balancing different flavors. (I’m at a Buddhist university in Taiwan for this semester, and our simple vegetarian meals are all provided by the dining hall, so I’m not able to cook. I hope the flash drives work out well (the wood is so elegant! ), and that Bali Asli continues to grow and thrive. I will be sure to recommend it to anyone I know who is headed to Bali! The hike was challenging but was a great way to explore the beautiful mountain. I am glad we did it as the temperature definitely was cooler than Uluwatu. I am glad that we hiked up and took the stairs down as the stairs going up may have killed my knees. Pura Ayu was amazing and definitely a highlight to cap the end of a long hike. We did “cheat” a bit and got on the motorbikes at the bottom of the stairs. LOL. It was just too tempting. Thank you for your advice and directing us towards this amazing experience. Back in the real world unfortunately. I just wanted to let you know that my friend Sue and I had a marvellous, instructive and totally delightful cooking day at Bali Asli. Pak Dewa was a great guide and cooking instructor…so calm, so helpful. Sue actually teaches Indonesian language and culture to primary school children and we have both visited Bali several times but we were able to stop, ask questions and take heaps of pics for Sue’s classes at the market so it was really useful. Just beautiful surroundings and far away from the madding crowd! And great food as well. I will try and return next year. We left Sanur early to get over to Bali Asli but the easy (hour and a bit) drive was great to see a bit more of Bali. Just make sure your driver knows how to get there. Bali Asli called our driver the night before to make sure and give him directions. THE VIEW is amazing!!!!!! We did the day in the life of a balinese lady. We then took our own car down into the village and walked around the local markets. They were friendly and fun to watch and take some pictures. Our guide/chef took time to tell us about local fruits and foods. We got to taste different fruit and palm sugar rice treats. Great experience 30 to 40min walk around the market Then we came back and had coffee and tea with Bali treats on a plate (too much to eat) The toilet view is a loo with a view!!!! We then had a lesson on how to make blessing/offering flowers and learnt the meanings/symbolism. We given loads of water and refreshing drinks. Then we got started on learning how to make 7 different meals. we ordered beers and coctails during the meals aswell. (mocktails and juices were on offer) The chef was great – spoke fantastic english and told us different things we could substitute the ingredients if we didn’t have at home. We then sat down to eat all our food we made!!!!!! Such a great experience. Oh we got to keep the apron too.. The cost was a bit exie.$$$ but for what we got I would have paid the same. around $100 aussie we did have a couple of coctails and beers. Market walk, morning tea, cooking class, 4/5 course meal and apron! I would come back here and do one of the other experiences on offer – check out the website. Fishing would be fun. We did the market tour and class with Penny Williams. We were here at Bali Asli last year and couldn’t wait to return and of course we were not disappointed by this wonderful experience. The market tour was fantastic fun and Pennys knowledge of all that is Bali, from the Hindu religion to all the types of food was just mind blowing. It was also great to see how she communicates with all the stall holders, she is quite a character! The class back at Bali Asli was immense so I recommend you have a small breakfast and don’t plan a big dinner that night. The drive up to the restaurant is lovely… steps up to restaurant give nothing away …once inside the space opens out to a vast dining room built with wood and natural stone …one whole side of the restaurant is open and gives sweeping views …of rice fields and the mountain …very beautiful. It is owned by Australian executive chef …Penny Williams…a wonderful person …very passionate about her food …here they cook real Balinese food using a traditional Balinese style kitchen…wood fired ovens ..and no electrical appliances for food preparation…. We had the best ever Nasi campur , served so beautifully like you have never had it before….it was truly delicious…..
Penny took time to come and welcome us on arrival and then chatted with us after we had eaten ….it was a very special afternoon…. Do yourself a favor ….put Bali Asli on your list of places to go ….it is a hard day to beat! We were a little late – our driver got lost. The walk was exhausting and fantastic at the same time. My husband was hesitate at first but we have not stopped talking about it being a highlight of our trip – and we have been coming to Bali once or twice a year for 20 years!! We will come again and will tell others the same. PS: the food was fantastic.